The alarm goes off earlier than on a weekday, but I’ve been awake for bit, paranoid about oversleeping. The light filtering through the blinds is cloudy and dim; Louisa is happily spooned, extra content because Hampton changed the sheets yesterday and the duvet is extra fluffy. But…. it’s time to get up. A topknot and swipe of bright lipstick to look as put together as quickly as possible, travel cup filled with hot coffee, and I slip out of the apartment leaving the rest of the pack snoozing away. …to help a carload of rescued pups make their way north to find forever homes!! Someone in the Skimm’bassador Facebook group posted earlier in the week about drivers being needed from South Carolina up through D.C. to New York City. While I adore sleeping in, once I verified everyone’s crate would fit, it was a no-brainer to volunteer. 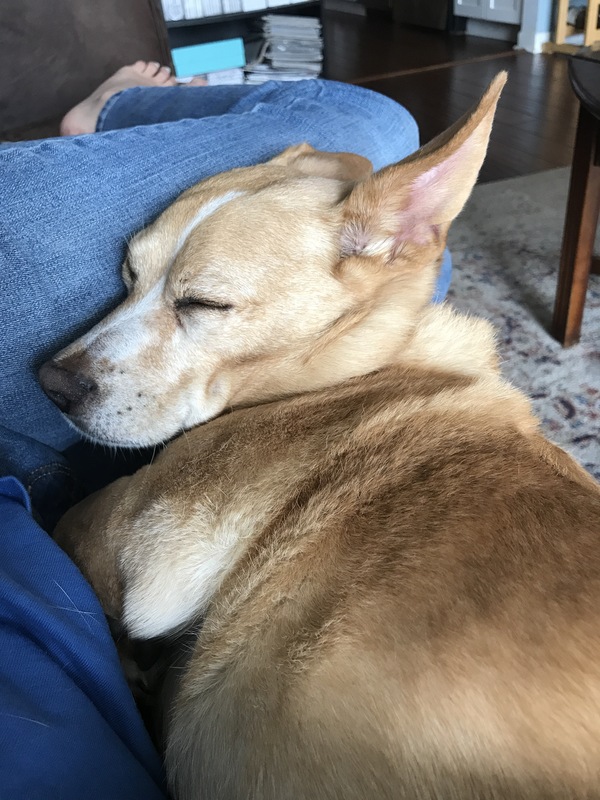 Especially because most of the rescues in this run were doxies, and Louisa is (supposedly) a dorgi – a dachshund/corgi mix! 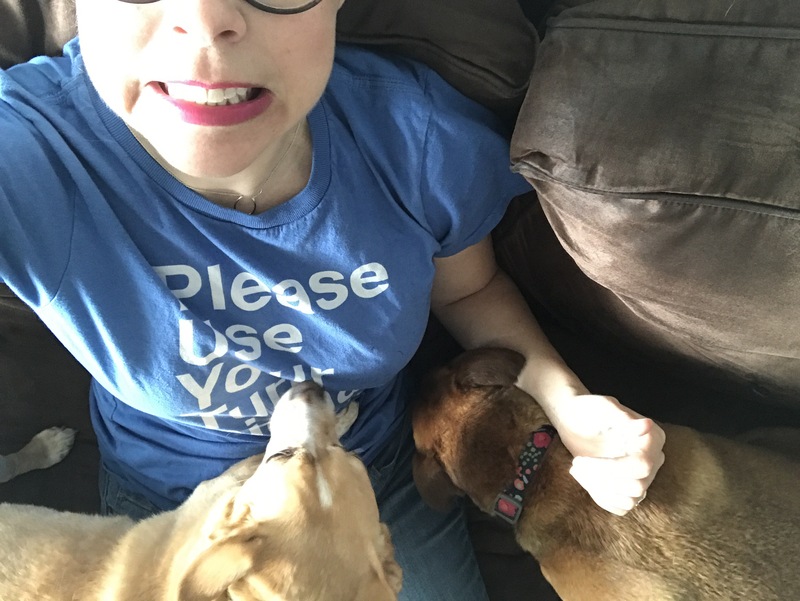 This is my “trying to play it cool but my car is full of puppies” face. Another easy hourish-drive later, the sounds of Google Play’s “Today’s Alternative Hits” [wearing my WFDD sustainer shirt, but too on edge to listen to the news as I drove my precious cargo] occasionally punctuated with barking spells from Lulu, a feisty wire-haired terrier, I arrived at a fast food restaurant outside of High Point, easily spotted the next driver, and the transfer was completed; ten scared and nervous little puppers on their way to the folks who are just waiting to welcome and love on them. Even Lucky, the chihuahua mix who looked a heck of a lot like a mix of George and Louisa. 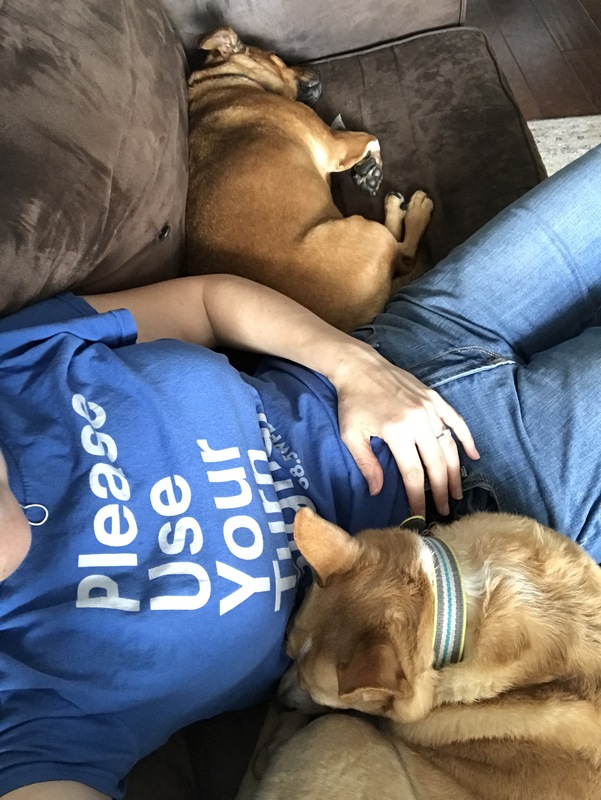 When I returned home, I was soon busted by our rescues for being around other doggos….. 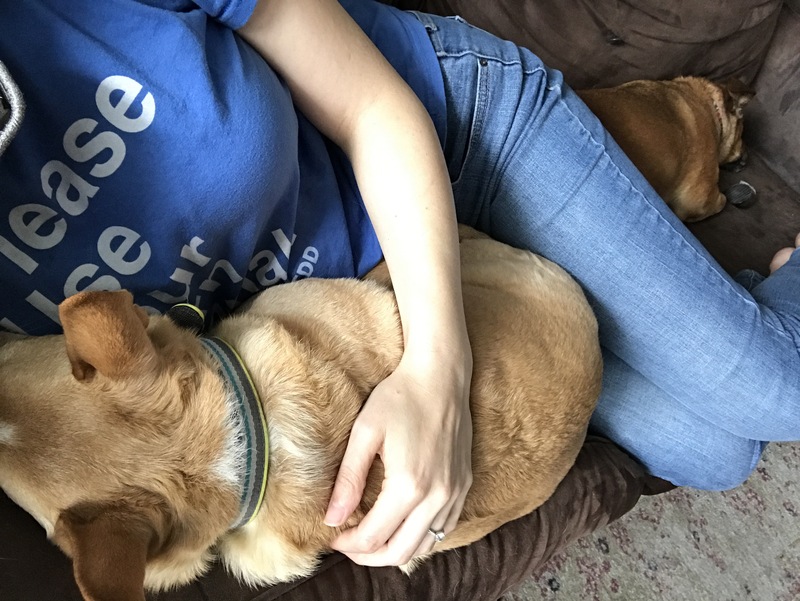 While every day is a dog day here in Flat 493, it was very special to celebrate National Dog Day by doing a small part to help some of the many, many dogs out there who need homes.